Home > Products > 1620 Delineatio Civitatis Et Portus Aquapolque. This fine print depicts the arrival of a fleet of warships at the port city of Acapulco and the welcome given them by the city’s inhabitants. The ships are outfitted with heavy artillery in the form of cannons. 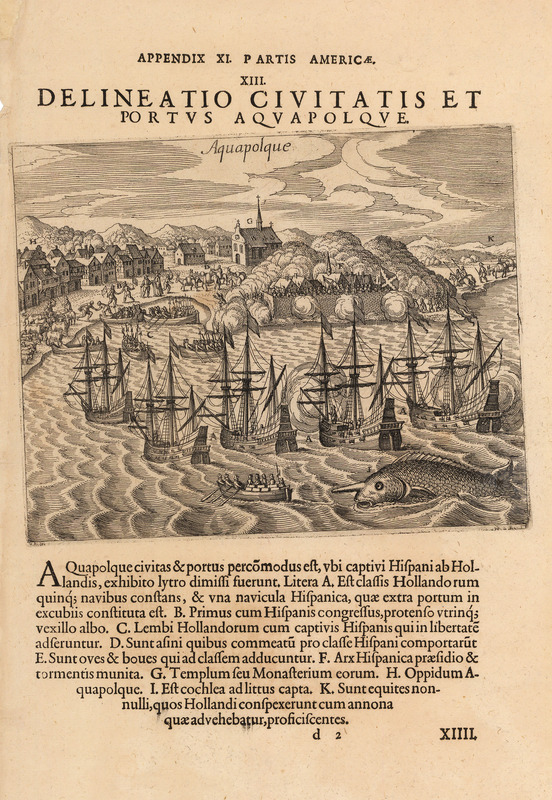 A number of rowboats are seen transporting crew members to the shore, and a marvelous sea monster resembling a narwhale is depicted a bit farther out to sea. Along the shoreline a row of houses and two churches are depicted, all reflecting Dutch influence architecturally speaking. Items and vignettes in the image are lettered for identification in the Latin text accompanying it. Condition: This map is in A condition. 1590 Descrittione Dela Gran Citta Et Isola Del Temistitan.